U.S. Top Round Steak (beef), BBQ sauce, apple cider vinegar, worcestershire sauce, brown sugar, liquid smoke, paprika, garlic, kosher salt, black pepper. The first thing I taste from the surface of these pieces is a heavy sweetness and light smokiness, much like a mild barbecue sauce. There's a bit of a saltiness, and a light touch of tanginess. For being marketed as a "Honey Chipotle BBQ" beef jerky, it doesn't quite hold up. I do get a lot of sweetness, much like what you'd expect from something labeled, "Honey", and I do get a BBQ sauce flavor, but I don't really get much of the chipotle. I pick up a smoky flavor, but it's more of the liquid smoke, and not so much the smoked chile flavor that I would expect from chipotle. Otherwise, the flavors that seem to define this jerky is largely a mild, heavily sweet, barbecue sauce, a moderate smokiness, and then a light natural meat flavor towards the end. The chewing also reveals a touch of tanginess. Considering this is said to contain chipotle peppers (mixed into the barbecue sauce), I don't get any level of heat. It's quite mild in terms of the hot stuff. Overall, I don't really taste much of any chipotle in this. It's a mild tasting barbecue sauce beef jerky with a moderate amount of smokiness. These are slices of whole meat, sliced into small strips and chunks of about two to three inches in length. 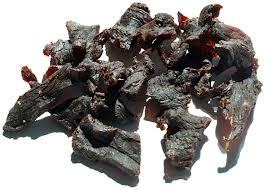 This is a dry jerky with semi-moist and sticky surface feel. The strips have some flexibility, but still stiff enough to require just a little effort into chewing. The chewing texture starts out feeling stiff and chewy, with some initial resistance, requiring a bit of labor to break down. It soon takes on a meaty, steak like feel during the chewing, and by the time it renders into a soft mass it feels just like a real piece of meat. I don't see any much of any fat or gristle, but I do experience a fair amount of stringiness in the chewing. Otherwise, I found no problematic tissues that I had to remove from my mouth. As for clean eating, my fingers pick up some stickiness, requiring a licking and wiping before touching the keyboard. 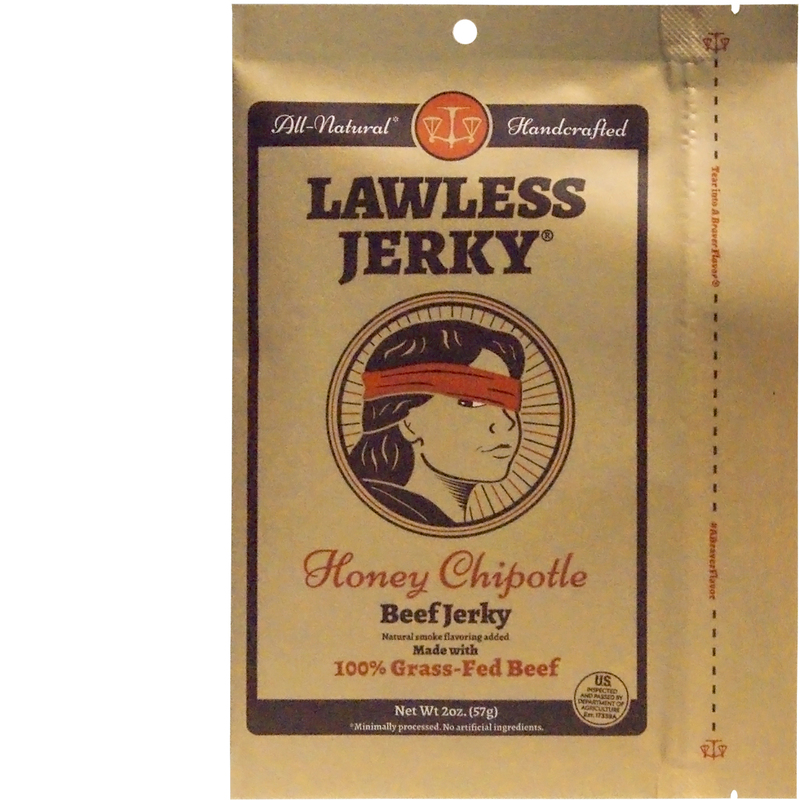 Lawless Jerky sells this Honey Chipotle BBQ variety at a price of $7.00 per 3oz package. If you buy 5 or more, it's $6.00 a package. No mention of shipping costs, but the box I received had a USPS postage label of $4.50. So, if you bought five packages, it would work out to a price of $2.30 per ounce. 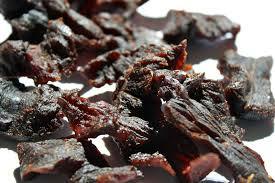 For general jerky snacking purposes, at the $2.30 per ounce price, it's a decent value. I'm getting a good overall flavor, good meat consistency, and good chewing texture. Compared to major brands of jerky sold in stores, this jerky offers a little more snackability for the dollar. As a "Honey Chipotle BBQ" variety, at the same $2.30 per ounce price, it's a fair value. I get the heavy sweetness of honey, and the tangy BBQ sauce, but I don't get any of the chipotle flavor. 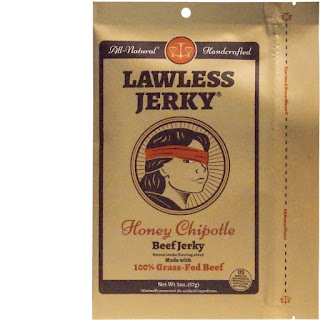 This Honey Chipotle BBQ beef jerky from Lawless Jerky has the sweetness of honey and the tangy barbecue sauce down pat, but it doesn't seem to give me much of the chipotle flavor I had hope for. I do get a smoky character, but it's the liquid smoke I taste, not the smoky chipotle flavor. Perhaps that smoky chipotle is there, but it's overshadowed by the liquid smoke. In that sense, if the liquid smoke were out, and the chipotle was amped up some more, it would come through better. Otherwise, it's still a good tasting jerky. The barbecue sauce has a mild character to it, seemingly suitable for folks who don't like a lot spice. It has a light tanginess from the vinegar and tomato paste which livens up the palate. Compared to other BBQ style jerky brands, it still seems to be above average. My recommended beer pairing, a lighter brown ale seems to work best. Try the Newcastle Brown Ale, or the Moose Drool Brown Ale. After reading your review of the 5star Lawless Jerky I decided to visit their website. I ordered the “The Full Seven” sampler pack and was anxiously awaiting its arrival. In the mean time I found myself in a store that actually carried one of their flavors (Honey Chipotle). I have to say I was a bit disappointed. I agree with you … If the package didn’t say chipotle on the front you would never have guessed it was an ingredient. The bits themselves where VERY dry almost teeth hurting to chew. I checked the package for an expiration date and it was well within the freshness date. I’m hoping for a better result with their other flavors.